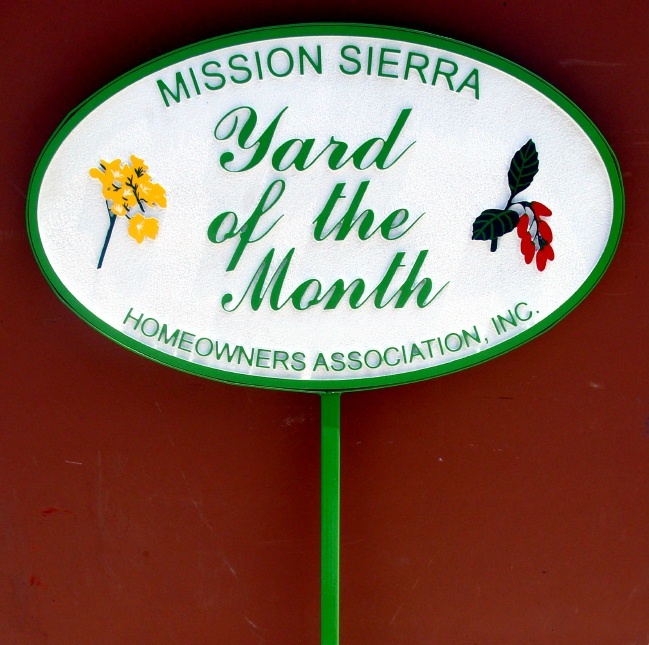 Above is shown a carved, smooth surface High-Density-Urethane (HDU) Yard-of-the-Month Sign for the Mission Sierra HOA. In this sign, the raised flowers, text and borders are carved in 2.5-D (raised, flat relief) on the smooth sign background. After hand-painting with bright, long-lasting automotive-type enamels, this plaque is clear-coated, dried and clear-coated again for waterproofing and UV protection.This sign can be purchased with a steel stake that can be easily inserted (it has a foot pedal) and removed in the ground for easy movement from one yard to another.